Well, as the hot temperatures hit most parts of the world it is time to get undressed, but in a sophisticated way. Swedish brand H&M has presented a new amazing lookbook for those young souls that like to be elegant and romantic in their summer looks. The newest lookbook is full of charming combos, dresses, and accessories. Well, H&M doesn’t stop amazing us by their brilliant collections that they release so often. One of their latest is ‘Romantic Edge’ dedicated to delicate girls that love to be elegant and charming during the hot summer months. The lookbook does its best to deliver the romantic side of some of the edgy accessories. First of all there are romantic short chiffon dresses, fabulous maxi dresses, and pleated skirts. Then there are denim shorts, slim regular jeans, and super-stretch twill treggings. At last there are Ribbed lacy tank tops, knit cardigans, jersey tops, tops with lace trims, Photo printed top, and an incredible imitation leather biker jacket for the edgy look. The ‘Romantic Edge’ Collection also includes studded pumps, sandals, and an extensive range of jewelry, starting from feather necklaces and earrings to spiral rings and 5-pack bracelets. The lookbook is fronted by Puerto-Rican model, Joan Smalls that succeeds in making the edgy and bold pieces look delicate and romantic. This proves that H&M is not going with the mainstream flow trying to experiment with the looks to deliver the best and fresh romantic outfits that will make any girl stand out. 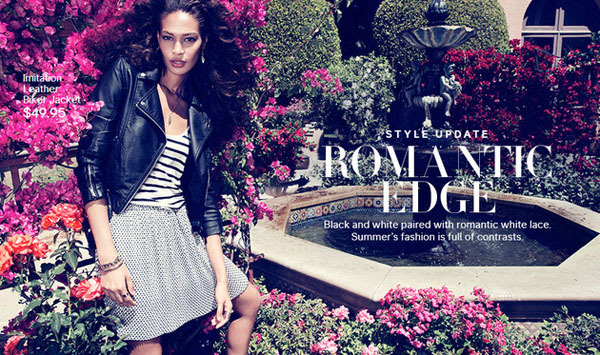 So if you are looking for fabulous pieces to look charming and romantic in these summer months, the ‘Romantic Edge’ lookbook by H&M is designed for you.